When it comes to trustworthy auto repair and preventative maintenance, TMS Auto Care is your go-to local solution. All of our certified technicians are here to ensure that your vehicle is working at its full capacity and is safe to drive. We’re happy to offer our well-rounded and knowledgeable services to customers in Champaign, IL as well as the surrounding areas. 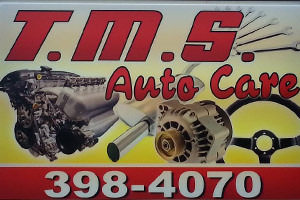 From simple maintenance to extensive repairs, TMS Auto Care is your go-to auto shop in Champaign, IL. We’ve provided high-quality, professional repairs, auto parts and maintenance services for the last 20 years, and we’re proud to offer customers in Champaign and the surrounding areas the service and advice they expect and deserve from an auto shop. Our ASE certified mechanics have the knowledge, experience and auto parts needed to service all vehicle makes and models, so you can rest easy knowing that your car or truck is in good hands at our auto shop. Whether your car has suffered damage as the result of an accident or regular wear and tear, or if you’re simply in need of your regular oil change, we’re ready to help. We work with trusted brands including Walker Exhaust, Moog, Goodyear, AC Delco, Motorcraft, Denso, Wagner Brakes and many more auto parts. We provide a full range of vehicle services, including auto repair and maintenance, auto electric repair, auto brake repair, auto exhaust repair and more. Our Auto Shop has been insured and ASE certified for auto repair and maintenance since 1995. We have been a member of the National Federation of Independent Businesses since 2003. We provide convenient local service to Champaign, IL and surrounding areas.